The Panasonic Lumix FZ18 was an amazing bridge camera. Except for interchangeable lenses, it had the qualities of a DSLR; it allowed precise control when taking pictures, from setting exposure to manual focusing. This picture was taken with the Lumix shortly before I upgraded to a Nikon D40. 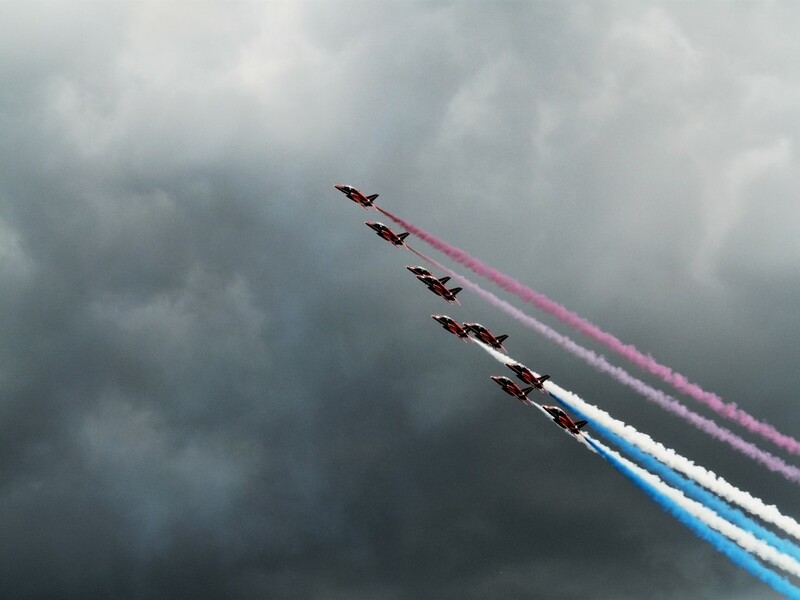 As the situation demanded, the depth of field was set to cover from the hyper-focal distance to infinity, then the camera pointed in the direction to capture the Red Arrows as they flew into the frame. The only weakness of the Lumix FZ18 was the amount of noise it produced. This picture is captured at ISO 100, yet is more grainy than pictures at ISO 3200 from modern DSLR cameras. I have some problems focusing at hyper-focal distance. I understand the concept, but only one of my three lenses have distance scale. That said, this is usually not a big problem. When shooting night photos, I tend to use a small aperture which tends to make things in focust over a greater distance. I like using the DOF scale. Apart from setting hyper-focal distance for landscape (and airshow photography), I use it to pre-set the DOF in street photography. Do you use the auto DOF feature of your Canon camera? Not the DOF preview button, but the “auto DOF” feature that Canon cameras apparently have. (You lock focus on the far object, lock focus again on the near object, then lock focus a third time to confirm auto DOF.) Look it up online. The proper way to focus when you have a big DOF is to do so on an object about 1/3 in the DOF range; not on a far object because your foreground might get out of focus then. I don’t recall having seen the “auto DOF” in the manual. I will have to check it out again. It was not easy for me to fine an object 1/3 of my DOF range. When I was shooting this: http://www.psaphotography.com/wp-content/uploads/Notre_Dame_de_Paris.jpg, I was on a bridge with only water between me and the church. I was not sure where the 1/3 was. I may well be unaware of a way to do this. You know, I think I like photography a lot because I learn something new every day, and have fun doing so. I did some research yesterday, and I don’t think my camera has this mode.